Since the new year, I have been doing my best to down size. We honestly live in a very minimalist household, but I tend to stock up a lot on food, including frozen food. I have this irrational fear of being hungry and having nothing in the house to cook. OK, back to the point of this post, recently I have been making meals using what I have in my freezer and ran across frozen seafood mixture from Trader Joe's that I had bought the last time we went on a major food trip there. The bag contains a mixture of small shrimp, calamari rings and bay scallops. I am sure at the time I had a major plan for it, but it had escaped my mind. The recent gloomy weather requires something warm eaten with a spoon, so I went to searching recipes that I could use with this seafood mixture. Pasta with a seafood (like this) always is my usual choice, but my husband is not much of a pasta fan and I would ultimately be the one finishing it off. 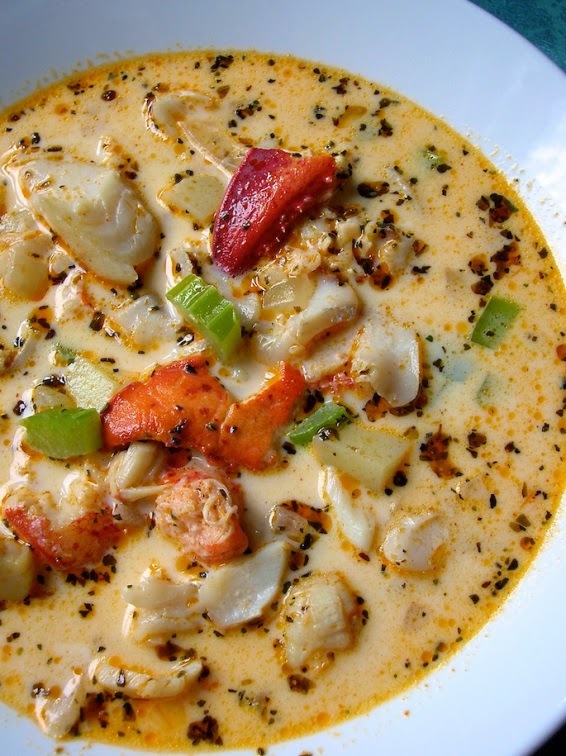 So, I and my thighs, decided against it and started searching for seafood chowder recipes, not that a cream chowder is any better, but you understand? There are a lot to choose from, but I ultimately decided on this one because I had all the ingredients I needed already. Remember that irrational fear of being hungry? It's actually helpful. I'm a bad blogger and took no pictures. Hunger was in charge. I actually followed the recipe as precisely as I could except for a few adaptations. 1- I used the thawed seafood mix (shrimp, scallops, calamari) instead of the fish and the lobster. Next time I will add the lobster because you know it will take this recipe to another level. 2- I added some sliced crisp bacon pieces that were left over from that morning and crumbled them on top. Follow the directions! Simmering at low is helpful to keep the seafood from getting chewy. The next day the chowder was really better, but we had so little left it was hard to share. I had made the chowder before noon and we actually ate around seven PM. It had plenty time to sit and get all those flavors to develop. If you are planning on making this for a group, double the recipe. What I made was barely enough for just the two of us.